The WPS 300 is a low budget barrier with impressive specifications. The barrier can be used in small to medium size parking lots and for closing parking terrains at companies. The flat barrier arm is made of aluminum and has a maximum length of 3 meters. 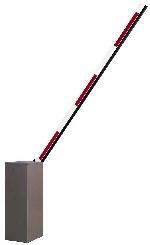 The WPS 400 is a high quality barrier arm with a flat arm. The barrier can be used in small to large size parking lots and for closing parking terrains at companies. The maximum length of the barrier arm is 4 meters. The size of the aluminum arm 100 x 18mm. Also available is a right-handed version of the WPS 400 barrier. The WPS 600 is a top quality vandalism resistant barrier with a round arm. The barrier can be used in small to large size parking lots and for closing parking terrains at companies. The maximum lenght of the barier arm is 6 meters. The aluminum arm has a diameter of 90mm.